The TanglePatterns.com TANGLE GUIDE, 2012 Edition, is ready! Woohoo!!! It’s ready at last! 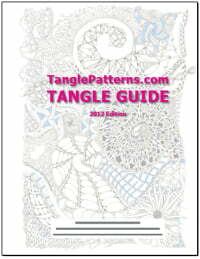 I’ve just finished tweaking the final details on the TanglePatterns.com TANGLE GUIDE, 2012 Edition. The beautiful cover art is courtesy of the very talented Tasmanian artist and CZT®, Michele Beauchamp. Today I am organizing myself for emailing it out and if my tests go smoothly (the file is 15MB! ), I’ll begin sending it out tomorrow. So it is possible you will receive your copy in a day or two. Rest assured it is coming. All the official tangles and all the tangles that have appeared on the site from May 2010 to December 31, 2011 are included in this 15-page publication. Where there are no published instructions for some of the official Zentangle® tangles, I’ve provided a blank space for you to draw them in yourself when you have learned those tangles from your local CZT®. And all the tangles are linked, so if you need a refresher on how to draw any of them you can just click on the image and be taken to the TanglePatterns page for the steps. Thanks so much for your patience! This involved WAY more than I anticipated when I first announced it on December 31st but I think you’re going to love it. My Mom does :-). 36 comments to The TanglePatterns.com TANGLE GUIDE, 2012 Edition, is ready! I want to thank you, again for all your hard work and dedication to all of us Zentangle junkies!! I simply love your site and you personally shine through all the work and committment you have for the site and the Zentangle Community as a whole. I would also like to know how to get a copy of the TANGLE GUIDE if one did not recieve it? Best wishes, peace and prayers for the New Year!!! WooHoo! Thanks, in advance, Linda. You rock! As long as your mom likes it I know it’s going to be great! Thanks again for all your hard work. You’re my “go to” site every day. I’m so excited! Can hardly wait to receive my New Year’s gift from you – and I thank you, in advance, for the long days of work you have put into compiling this book. YAY!! This is so exciting, like Christmas all over again. So, we will receive it via email, right? Thank you again, Linda, for all that you have done and continue to do!! I’m so happy to hear the good news. I will finally use my Zentangle kit. You are a very artistic and kind lady. Thank you for all of your work and dedication. Linda, Thanks do much for all you do! You are appreciated! Can not wait. Zentagles Forever!!! I am new to Zentangle – first saw it on the Dreamweaver Blog. I’m hooked!! Can’t wait to get my copy. I’m new to Zentangle but what fun. Thanks for providing these tangles. What a great reference. Thank you for all yur hard wrk on this up coming guide. I can’t wait to receive it. I am on your site everyday checking out tangles, ideas etc. AWESOME!!!!! I am so hooked to ‘tangling’. Thanks Les, and everyone! My Christmas tree is still up and until yesterday I had reindeer hanging off my dining room light fixture – I’m hoping to “de-tree” and put everything away this weekend. It’s been a very intense 2 weeks. And to those asking how to download it, it isn’t available to download. I will be emailing it out to everyone who has financially supported the site. Visit the “Donate” page for more info if you haven’t been following these developments. P.S. My Christmas tree is still up too — if it brings you joy — why not! You’re right, Kake, the tree still looks lovely. Love ya!! Am new to Zentangle. Loving it. Thanks for Guide. Can’t wait-excited! Hi. I just found your site yesterday and I am already in love with it. I went out and bought some pens today. I have had the books on my Amazon wishlist forever now but I also work with polymer clay, so I have been spending a lot of money on that. Funny thing is, I asked to observe the Detroit Polymer Clay Guild on Thursday before I decide to join and the coordinator told me yes and informed that there would be a special guest tomorrow night. Funny thing is: it’s about zentangle. Sometimes I do believe things are meant to be. Thank you for your hard work in putting together this great blog. I hope today is the day for the PDF file with all the tangles in it!! Thank you in advance LInda! I can’t wait! This is such a treasure trove of information all in one guide. I am new to this art form and love your site. Hi Analisa, if you have financially supported the site you WILL receive the Guide. Visit the “Donate” page for more details. Thanks! Linda, This is AMAZING!!! I love it. It needs to be an app so that I can have it easily accessible at all times like: meetings, long trips (when I’m not driving) concerts or sitting with a friend in the hospital. WOW! Thank you, thank you, thank you! Forgot to comment on the LINKS! Another WOW. That was very smart and I greatly appreciate the effort to link the tangles. Nicely done, Linda!! This will stay on my computer’s desktop for handiness! Thank you! I love the Tangle Guide you put out, Linda. It’s like a large version of the Tangle Pattern Refreshers put together. This is really awesome and I want to thank you again! I just donated and so look forward to my copy of the PDF. Thanks so much for the great site and all of your hard, hard work! Hi BrendaLea, thanks so much for your support. I see you have a Comcast email address and Comcast blocks large files so I can’t send it to you there. If you would please send me a gmail address asap, I’ll get TANGLE GUIDE out to you. Thanks! I’m sure my roadrunner email doesn’t have the capacity for the file, is it possible for you to upload it as a link on this site? I would LOVE to review it. I am always so enamored with the patterns I receive daily!! There is no link for the file, I email it myself after I receive the transaction notice from PayPal.